[1:28] <savid> So, I'm pretty sure I fried my pi, but I'm curious as to what exactly I did. It could be that I put 5v on the wrong GPIO pin, but not sure. Basically what's happening now is when I plug it in to USB power, the power led comes on but then slowly fades, and the CPU heats up really quickly. [2:27] <devslash> ive got an old ipod classic 120GB. is it possible to use it as an external hard drive without requiring a usb hub? [4:08] <alpha1125> or do an fsck on the sdcard from a mac, or another rpi? [4:08] <alpha1125> SirLagz, mac or another pi? [4:09] <alpha1125> okay, how do I mount to fsck from a mac, on an rpi sd card image? [4:20] <alpha1125> can't mount it… seems like ext4 isn't support on osx. [4:21] <SirLagz> in that case. the other pi. [4:21] <alpha1125> from diskutil, the partition manager for osx, the partition shows up, but not mountable… or verifiable. [4:50] <pksato> ekaj: you changed GPU memory size? [4:51] <ekaj> What does changing the GPU mem size do? [5:07] <tacowho> what does it do pronto? [5:07] <SirLagz> rpis keep growing and growing ! 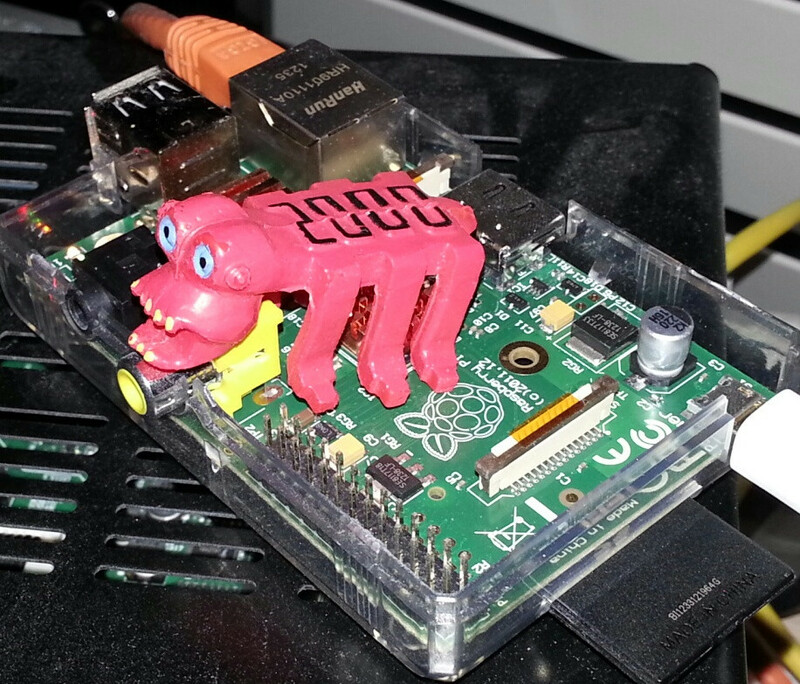 [5:12] <tacowho> so has anyone played with the GPIO on their RPi? [5:17] <tacowho> thats wicked pronto! [5:35] <lkthomas> anyone using any USB IR device which works with RPi ? [5:37] <tacowho> u tryin to hookup remote? [10:19] <voxadam> If I want some local storage on my Pi what will perform better, a "high class" SD, or a USB stick? [10:22] <voxadam> Thanks. I wonder if anyone makes a case to hold a Pi and a 2.5" drive. [10:23] <voxadam> Good point. Looks like I'll be building one of my own. I love having a CNC machining center. [10:24] <voxadam> Now I just need to find the time. [10:25] <voxadam> Do USB sticks perform that poorly compared to spinning disks even in Pi Land? [10:27] <voxadam> I don't do much writing to my SD card so that shouldn't be an issue. Plus, I buy Sandisk or other good cards. [10:28] <voxadam> I'd boot the thing over the network if it supported PXE. [10:29] <voxadam> I'll have to look into that. [10:31] <voxadam> I just love the idea of a 700 MHz ARM board being used in conjunction with iSCSI. Maybe I should try to build a Fibre Channel adapter for the thing. [10:31] <voxadam> Isn't there quite a bit of CPU overhead for the SCSI stack? [10:32] <voxadam> A real NIC would be a godsend. [10:34] <voxadam> You're probably right. I'm just old and have been wary of USB NICs for a long time. [10:38] <voxadam> What I'd love to see is a version that ditched the RCA video (or pinned it out to a header, maybe along with the audio jack), swapped the SD for a MicroSD, and moved as many of the ports on to one edge of the board (or two adjecent edges if need be). [10:40] <[Saint]> the RCA jack out takes up virtually no space (well, none that wouldn't be occupied by a useless void of blank space were it not present), and it *really* lowers the bar for this thing to "Just Work (TM)" on as many devices as possible. [10:41] <[Saint]> Add to that the fact that purchased in bulk they cost a few cents each, it makes all the sense in the world to include it. [10:41] <voxadam> All fair points. [10:41] <[Saint]> I for one love the fact that this works on any televisual device with RCA-in. [10:42] <[Saint]> raspberrypi on a 60yo television with a betamax VCR? [10:42] <[Saint]> ...that's pretty cool, really. [10:43] <[Saint]> This is true. [10:43] <voxadam> I just wish that there were fewer connectors so the ones that remained could all be placed on one edge of the board. It would just make for a cleaner install when being used in places where neatness counts. [10:43] <[Saint]> WHat I really enjoy about RCA video out is the massive fleet of LCD backup camera displays you can purchase for virtually nothing to give any project a visual output. [10:44] <voxadam> I like the idea of auto backup LCDs. They're a dime a dozen. [10:45] <[Saint]> some even have audio-in, and then you just need RAC->3.5mm cable or adapter. [10:46] <voxadam> Do heatsinks really help much when overclocking? Most projects of mine don't need the horsepower but XBMC could always use a bit more as the damn program is written like an old video game and redraws the entire screen on every refresh (not exactly modern design). [10:46] <[Saint]> Depends how far you're OCing. [10:46] <[Saint]> sub 1GHz, no. [10:46] <ShiftPlusOne> voxadam, the little heatsinks you get off ebay do absolutely nothing. [10:46] <[Saint]> Not at all. [10:47] <voxadam> I wasn't aware anyone went beyond 1 GHz. [10:47] <[Saint]> 1.2GHz+, and, yes. [10:47] <voxadam> What kind of heatsinks? Fans too? [10:47] * [Saint] awards quackgyver one "w00t!". [10:47] <[Saint]> use it wisely. [10:47] <ShiftPlusOne> quackgyver, hoot! praise to you, kind sir. [10:48] <quackgyver> Thank you, thank you, I bow to thee. [10:48] <quackgyver> Too bad I lied. [10:48] <quackgyver> Just kidding. I'm working on an IRC Client. [10:48] <quackgyver> Based on the IRCCloud API. [10:49] <[Saint]> which blows my efforts out of the water. [10:49] <[Saint]> however, that guy can't hold it stable...no way. [10:49] <voxadam> Using what? Flourinert? [10:49] <[Saint]> It falls over within ~30s, so, it kinda doesn't count. [10:49] <voxadam> Well, that's not exactly something to brag about than. [10:52] <ShiftPlusOne> hifi, maybe a degree or two. As you know, there is not much heat transfer between then actual bcm chip and the ram, so they are probably ok for keeping the ram cool, but I don't think that's why people buy them. [10:52] <[Saint]> hifi: I believe you could re-parse that more accurately as "absolutely nothing useful". [10:53] <[Saint]> you can achieve the same ffect by lapping the SoC a little. [10:54] <hifi> it might be more useful for the nic/usb chip? [10:56] <ShiftPlusOne> but does the hot eth/usb chip affect the board negatively in any way? Other than maybe shortening the life span of that chip. [10:56] <hifi> why stop at 4? [10:58] <ShiftPlusOne> and for some reason, everything on that table looks huge. [11:02] <hifi> ShiftPlusOne: "And the copper pipe is not insulated. The white stuff on it is snow." [11:06] <ShiftPlusOne> normal as in with a fan? [11:08] <ShiftPlusOne> Haven't done any testing myself though. I think [Saint] knows a fair bit about it. [11:08] <[Saint]> It varies *greatly* by unit. [11:08] <[Saint]> I have one pi that flatly refuses to clock over 1.2GHz. [11:08] <[Saint]> I have one I can hold stable around 1.8GHz. [11:08] <hifi> with no cooling? [11:09] <voxadam> What kind of cooling? [11:09] <[Saint]> passive cooling with a fairly large fin, but in an area with good airflow. [11:09] <[Saint]> and rather a lot of thermal adhesive. [11:09] <voxadam> Where do you find decent heatsinks? Do you just cut down desktop heatsinks? [11:10] <[Saint]> I think this was an old nothbridge cooler. [11:12] <davor> how are soldering iron tips heated up? simple heat conduction? [11:13] <voxadam> We used to have a great electronics surplus store it town. I really miss that place. [11:13] <[Saint]> The seller is a sucker. [11:13] <voxadam> No, the buyer is a sucker. [11:13] <[Saint]> It he added "for raspberrypi" he could charge at least 100% more. [11:13] <nid0> why exactly is the buyer a sucker? [11:15] <hifi> http://www.heatsinkfactory.com/zalman-zm-nbf47.html this would look badass on a pi, "what you got there? O_O"
[11:15] <[Saint]> it offers basically no additional surface area. [11:16] <davor> for... southbridge I think? [11:16] <nid0> you do realise that that product is (and is being sold quite clearly as) a shim, right? [11:18] <voxadam> I wouldn't mind cutting something like this: http://www.ebay.com/itm/NEW-Dell-PowerEdge-PowerVault-Copper-Heatsink-M1326-/250658080499? into a few pieces and using it on a Pi or two. [11:19] <davor> haha, I had no idea those glues were so strong. how do you pull it off then? [11:20] <voxadam> hifi: Why were you disasembling your DSL modem? [11:20] <voxadam> Were you planning on overclocking it? [11:21] <[Saint]> thermal bond/adhesive isn't really particularly "strong" per se. [11:21] <voxadam> I can't argue with that. It actualy is a pretty damn good reason to take a modem apart. [11:21] <[Saint]> It has a very good surface tension, though. [11:22] <[Saint]> hifi is quite right, they are very strong if you try to pull it straight off, but, twist it a little first and its very easy to remove. [11:23] <[Saint]> It never really sets hard, unless its many years old. [11:23] <voxadam> Oops. Wrong window. [11:36] <davor> hm, which ones would you suggest then? [11:45] <davor> just before I go off, would you recommend this one http://www.chipoteka.hr/artikl/9978/lemna-stanica-sa-temp-kontrolom-zd-937 or this one http://www.chipoteka.hr/artikl/105115/lemna-stanica-sa-temp-kontrolom-vtssc30n#tab-info-tab ? [11:46] <ShiftPlusOne> no idea.... cant you get replacement parts for them? [11:47] <ShiftPlusOne> That ZD-937 looks a little too plastikey and toyish, so I don't know. The actual irons looks identical on them, so I don't see them being too different. [11:51] <ShiftPlusOne> Np, if you need me to pretend I know what I am talking about, I am always here. [11:53] <ShiftPlusOne> the tip not fitting? [11:53] <[Saint]> just the tip? [11:55] <ShiftPlusOne> I am sure importing this stuff to where you are isn't cheap, so there's a bit of premium to pay.... not really their fault. [11:56] * ShiftPlusOne isn't sure about using a hot air station as a substitute for a soldering iron >_<. It's great to have both, but if I had to choose, I'd keep the iron. [11:59] * ShiftPlusOne considers ordering a few and seeing how they go on ebay. [12:00] <ShiftPlusOne> davor, even from china? [12:05] <davor> cya, and thanks! [12:58] <leomcmartin> Hello! I'm trying to get the Pi and a PIC32MX695F512L microcontroller to communicate by connecting the PIC32 to a USB port on the Pi. The two communicate using the USB CDC protocol, which the Pi seems to handle for other USB devices, but apparently not the PIC32. However, lsusb shows that Raspbian has seen the PIC32. Does anyone know how to get the two to communicate? [13:04] <mgottschlag> leomcmartin: does dmesg show anything? [13:09] <leomcmartin> No, it doesn't, and I thought that lsusb was showing it up, but I mistook it for another device that got picked up. The PIC32's definitely working though. [13:20] <leomcmartin> The PIC32's actually part of a kit that I bought a couple of years back (I don't know if you read the Australian Silicon Chip magazine, but it's a microcomputer called the Maximite that featured in there) and I've used it with USB squillions of times, so I don't think it's that. [13:22] <leomcmartin> mgottschlag: Interesting, I've never really had any issues with the Pi USB before now, apart from power issues. I've shorted the polyfuses on the USB ports so I don't think power's an issue. Plus, the PIC32 isn't bus-powered at the moment, it's running off a wall wart, so that shouldn't be an issue. [13:24] <leomcmartin> Yeah, I was thinking it was a driver issue; when you boot the PIC32 up in bootloader mode it connects as a USB human-interface device and it's visible in lsusb and dmesg. [13:28] <leomcmartin> I can connect my Windows laptop to it and you can connect to it and it runs fine, as well as if I boot up in Ubuntu Linux. So I'm pretty sure the Pi just doesn't know how to communicate with it. [13:31] <leomcmartin> How do you see USB traffic with wireshark? I've got it installed and everything, but I've never used it for anything other than network traffic. [13:37] <voxadam> Has anyone done anything with the DCI interface on the RPi? [13:41] <leomcmartin> That may have been entertaining, depending on whether or not you managed to unplug your appliances beforehand. [13:42] <Amadiro> Well, I shut down my desktop computer at least -- nothing else seems to have taken damage. [13:45] <Amadiro> that's something, I guess? [13:46] <leomcmartin> Haha, I guess! Unfortunately (or fortunately, depending on how you look at it) I've never seen stuff get obliterated by lightning before. [13:47] <heksesang> Does anyone know if it's possible to run something similar to the Dokan library for Windows on the Raspberry Pi? [13:48] <leomcmartin> Righto, so long, and thanks for all the fish. [13:49] <heksesang> And does the RPi have enough power to effectively deal with client-side decryption when it downloads files from a cloud service? [13:51] <leomcmartin> Amadiro: Yeah, there's definitely something odd going on. Oh well, see ya! [13:52] <heksesang> Say I'm downloading files from Mega or something, they are probably encrypted with some sort of AES. Would it be unrealistic to try decrypt that at a bitrate of 25 mbps with the Pi? [13:54] <voxadam> Well, a bit of experimentation shows that my Pi will run at 900 MHz just fine without any modifications. Though, 950 is just a bit too much for it, it immediately panics. I really should have backed up my config before I pushed it like that. Maybe I'll find a decent heatsink around to hack up and fit onto my board to see if that helps. [13:59] <heksesang> My grand plan is storage of video and music files at Mega, a FUSE client on the RPi that exposes direct access to the files there and XBMC (will probably need to modify Rasbmc, unless it allows me to do this with the prebuilt image) to play the files. [14:02] <heksesang> Subtitles are rendered on the CPU, so might be low on CPU power to get that job done if I run a FUSE client too. But if the RPi is able to decrypt the video and audio in realtime, the H.264 circuits and DD/DTS pass-through should allow me to directly play the video and audio on the RPi without any subtitles. [14:13] <Amadiro> heksesang, I do the same thing via ftp and sshfs, and it works for me. Even HD video doesn't require that much bandwidth. [14:17] <heksesang> I assume skipping and such will be slow. Caching might not be so effective on the RPi as it would on a more powerful device. But if I watch stuff sequentially, that should not be a problem. [14:17] <heksesang> I just hope decrypting the files won't be too demanding. [14:17] <Amadiro> probably not, but only one way to find out. [14:18] <heksesang> Might exist some tools to test decryption speeds on a system. [14:19] <heksesang> Well, I can write something myself if it's just inefficiency of megafs that stops me, as long as the system is actually able to decrypt fast enough if done efficiently. [14:34] <ShiftPlusOne> You can either replace bootcode.bin to run straight vc code with nothing else, or you can send a vc kernel from linux to execute. [14:34] <Amadiro> ozzzy, check out #raspberrypi-internals. [14:35] <ShiftPlusOne> phire is working on a LLVM compiler, while others are working on gcc. I think there was talk in packaging it up and making it more available to the masses. [14:36] <ShiftPlusOne> aye, all the links to all the tools are on the page I linked. [15:12] <pronto> is it pluged in? [15:12] <pronto> is it on an outlet that has a switch? [15:12] <pronto> 40 mintues away!? [15:14] <davor> and I *will* be back! [15:16] <davor> socks and shoes on, cya! [15:26] <tig|> SirLagz: longer desk? [15:26] <IT_Sean> They make desk mounts for LCDs. [15:27] <IT_Sean> WE DEMAND MORE LCDS! [16:10] <yehnan> what do its last two parameters mean? [16:34] <dreamreal> okay, this is good and bad: I was wrong. It's not sending duplicate signals; the renderer I'm using is handling the (single) signals poorly. [16:34] <dreamreal> How freaking odd. [16:41] <nid0> mind if I message you privately a sec? [17:00] <troulouliou_dev> hi does pi support dts hd ma passthrough ? [17:08] <regis> mgottschlag: Thing is that I don't need any communication when it is mobile (aside from GPS). I have tried several linux distributions and freebsd10 and in every case my monitor shows 'no signal' when it is connected after powering up raspi. [17:09] <regis> Hm, maybe it's just HDMI port that is not powered/enabled and the rest is working fine? [17:16] <bts__> which arm reference manual should I use? armv...? [17:29] <regis> mgottschlag: It's indeed only HDMI port that's disabled when disconnected at boot time and every thing is working perfectly. Thanks! [18:08] <bigx> here's what I did : http://unix.stackexchange.com/questions/86409/setup-ad-hoc-wifi any idea of what is wrong? [18:09] <BigShip> heya, does anyone know if minecraft pi will work on pibang? [18:36] <nmpro> what's going on with everyone? [18:51] <TheSeven> does kernel.img typically contain an initrd somehow, or does the pi typically boot without one, straight from the rootfs? [18:59] <propheticsquiddy> hello, anyone working on networked pi's? [19:01] <IT_Sean> you are going to have to be more specific. Almost everyone in here with a Pi has had it on a network at some point. [19:01] <PhotoJim> Both of my Pis are networked, but they do not have any distributed services between them. [19:03] <IT_Sean> networking via bluetooth? That's a whoooole 'nother ball of hair. [19:06] <IT_Sean> ... ... ... why wouldn't you just use a Model B. It has a networking port on it. All the hard work is done for you. [19:08] <nmpro> off topic question. What is a good light weight distro to use as a file server for my collection of vids, mp3, etc ? [19:11] <troulouliou_dev> nmpro, on pi ? [19:18] <nmpro> troulouliou_dev, nah.. I'm using oe pi. This would be on intel or amd platform..
[19:23] <PhotoJim> nmpro: a Pi won't make a great server, but Raspbian is lightweight enough if you don't run a GUI on it. just run it in the shell only. there's a new version of it that permits a very stripped-down installation if you prefer. [19:23] <PhotoJim> nmpro: ahh, in that case I'd recommend Debian myself, and again, no GUI. and expand the RAM (most likely). [19:23] <PhotoJim> a GUIless server with a gig of RAM is nice and comfortable. you can certainly live with less though. [19:40] <nmpro> PhotoJim, ok.. thanks for the suggestions. I'm just trying to find a lightweight distro that will run w/ out issues on my ancient laptop..
[19:44] <nmpro> thanks CeilingKitten.. I'll do a live boot and check out that distro. [19:45] <CeilingKitten> umm other wise nmpro not sure what its base os is but SMS - Superb mini server, has everything installed already webmin, rtorret, ftp, smb, etc,. [19:46] <nmpro> CeilingKitten, hmmm.. I think I'll download SMS and check it out..
[20:59] <gyeben> Can I force SDL on the Pi to use a specific resolution? [21:48] <PhotoJim> nmpro: my first server (a few years ago :) but only probably ten) was a 486sx25 with 8 MB of RAM running Debian. [21:51] <PhotoJim> it has 32 MB of RAM and I put a faster processor in it so now it's a 50 MHz 486DX. [22:04] <IT_Sean> or you could not be a pansy ninny floofer and just swat it with a newspaper, like a real man. [22:12] <Encrypt> Who did install PHP with NginX? [22:35] <TheSeven> so, does someone happen to know if (and how) an initrd/initramfs could be loaded on a pi? [22:36] <BigShip> Is anyone running pianobar on their pi? [22:36] <TheSeven> is that documented somewhere? [22:40] <pksato> TheSeven: why you need initramfs? [22:42] <pksato> I dont remember how squashfs works on boot time. [22:45] <kephra> most of my other systems boot an nfs root via dhcp/tftp - wondering - is this possible with PI also? [22:45] <IT_Sean> talking about netboot? [22:52] <rikkib> I use 2gb sd cards with just boot on it. [22:53] <TheSeven> does someone happen to have a clue what dwc_otg.lpm_enable=0 actually does? [22:55] <TheSeven> the big question is: what the heck is "LPM"? [22:56] <pksato> low power mode? [23:03] <rikkib> Ahhh... Played in that area to... I have stm32v connected to rpi via serial. Took a little bit of figuring how to get rid of crud at boot time but it can be done. [23:10] <[ilin]> Hi, does anyone have a working Ralink 5370 USB dongle? [23:22] <[ilin]> l_r: does it work with raspbian? or you need new drivers? [23:23] <l_r> do you have similar problems? [23:59] <TheSeven> hm... so does the kernel in hexxeh's rpi-firmware repository even support initramfs?